Here’s the FREE REPORT You Need to Know!… Please read carefully, as this topic pertains to your future health and well being. – How Even “Minor” Injuries Should Get Checked and Evaluated. – The Importance Of Documenting Your Injuries Immediately So That You Get The Settlement You May Deserve! – How To Get The Correct Treatment At No Cost To You. So sit back and let me give you the strait talk about what’s happening with thousands of accident victims. Every year in the U.S. alone there are over 3 million injuries caused from car accidents. Even after receiving treatment, studies are showing that most of these victims continue to suffer long term pain after the accident. And, as many as 12% of these victims end up disabled with very little compensation. Something is not right with the system! In this day and age it’s hard to understand why so many car accident injuries are not getting better. Many researchers are now looking into what makes these injuries so different and what they’ve found may shock you. In the United States it seems that more and more people are not receiving the needed treatment for their injuries. So many of these individuals end up settling their cases far before the full extent of their injuries are discovered, leaving many to foot the medical bills themselves. Research shows that some of the fault remains with the patients themselves because they failed to seek the appropriate treatment for even minor injuries. But now experts are finding fault with many in the medical field that may not have the skills to give appropriate advice or care to these types of injuries. advice and ineffective management seems to be the rule. Even well meaning doctors can unknowingly give recommendations that cause these injured patients great harm. The simple truth of the matter is that very few health care practitioners know how to efficiently diagnose and treat the hidden injuries sustained from a car accident. According to two separate studies featured in the Journal of Bone and Joint Surgery most medical doctors just don’t have sufficient training with musculo-skeletal injuries (Soft tissue injuries). The study examined the competency levels of nearly 419 medical graduates, residents and staff physicians. It revealed that approximately 80% of them “failed to demonstrate basic competency” in their knowledge of musculo-skeletal medicine. It’s no wonder why so many car accident injuries fail to get the appropriate care. Car accident victims that seek help from your average community clinic or family practitioner may not be getting all they need. In General, most doctors feel comfortable treating general illness and other related conditions but when it comes to pain from a car accident, far too many physicians quickly gloss over the patients symptoms and mask them with drugs, therefore missing subtle signs that may indicate a more serious problem. accident. In this age more and more people are using the emergency room as a primary care Clinic. They go there for headaches, fever, sprains, strains, general illness, over doses and of course trauma. punctured lung, internal bleeding or some other life threatening injury, the E.R. doctors are going to quickly send you on your way, because they have another 10 patients waiting. You’ll probably get some medication and a recommendation to follow up with your primary doctor, who may or may not understand the nature of these injuries. many victims simple go home and wait for the pain to go away… But usually it never does, in fact it can get a whole lot worse because the injured body part start to degenerate. This is simple not true, there is a better way! practitioners are neck and back pain following an accident. On a number of occasions I’ve had doctors approach me and say, “I just don’t know what to do with these patients.” Most practitioners just end up treating these patients by masking the symptoms with painkillers. Unfortunately, this approach sets the patient up for a life time of prescription drug addiction and misery. cause damage to your liver, your stomach, your kidneys, etc… need I say more. therapy you are running the risk of becoming a statistic. Redundant prescriptions of Vicodin, anti-inflammatories, and muscle relaxers are no substitute for curative treatment. Using drugs as a sole treatment is like covering up the ‘oil warning light’ in your car with black ink. There are other specific treatments that need to be performed. (On a side note: while on heavy medication you may get a call from the insurance adjuster to settle. Beware! A lot of auto accident victims receive inappropriate care, and then while the underlying damage and pain are hidden or numbed with drugs, they settle their case too soon. This happens all to often. What Are The Hidden Injuries That Doctors Miss? common areas, the neck and back. The rapid shifting motions of the neck and spine during a crash can result in a number of injuries, many of which are near impossible to see on x-ray or MRI and that is why so many of them are missed. 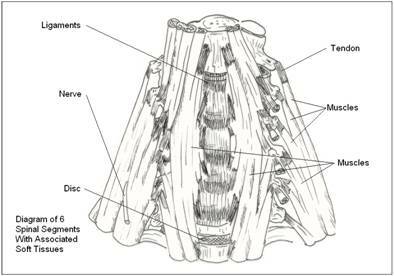 capsules, discs, ligaments, tendons and muscles right up next to the boney spine. Sometimes the pain comes on immediately and sometime it takes a few days as the muscles and ligaments slowly begin to swell. The stiffness is slow and progressive and can go unnoticed. Once the spinal joints have lost their motion, they begin to degenerate. And now instead of just a nagging ache, the pain becomes intractable. You will find it difficult to freely move without pain. Sitting or standing for long periods become difficult. Most who find themselves in this position are unable to enjoy life. Continuing, chronic pain often can lead to depression. Some doctors believe that depression causes the pain and prescribe anti-depressants. But, usually it is the other way around. Pain causes the depression. to go into a protective spasm, often clamping down on the joint keeping the injured joint in a poorly aligned position. capsule folds, in muscle, in and along tendons and on the cartilage surfaces. This fibrous tissue was discovered to be unlike normal soft tissue. Normal tissue has an elastic quality that allows your joints to move and be flexible. However this fibrous tissue does not possess much elastin, a protein that gives normal tissue its stretchy quality. 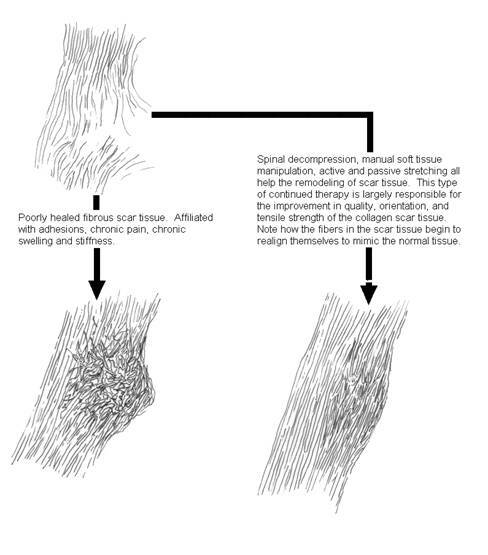 It was noted that the longer the joints went untreated the more rigid and full of fibrous scar tissue they became. It was shown that the fibrous changes in the joint caused abnormal wearing and ulcerations in the cartilage. Further neglect caused joint degeneration. This type of improper healing is why so many victims have lasting problems up to 7 years later. 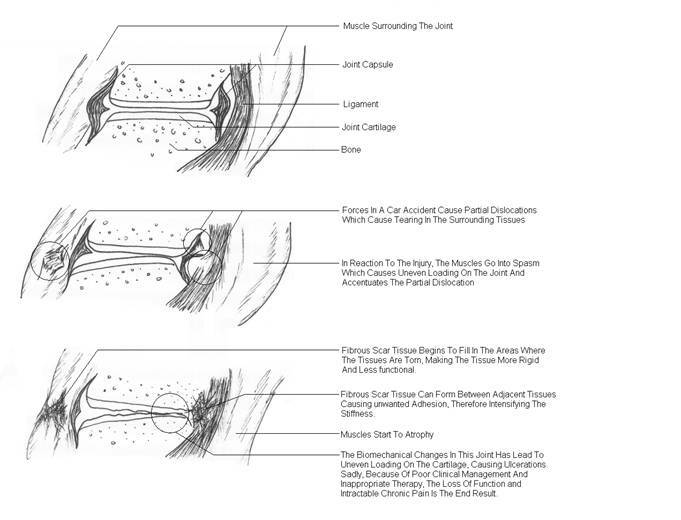 The new fibrous collagen laid down for repair is always arranged in an irregular pattern (see diagram above), which is much different than the orientation of the fibers in normal soft tissue. The fibers in normal soft tissues (whether it be muscles or ligaments) are much more organized. As a general rule they run parallel to each other which make the tissue able to optimize their resistance to tensile forces. Therefore the disorganized fibrous scar tissue is much weaker. It is more sensitive to pain. It tears easier and it is less functional. The solution: Fortunately, there are new therapies used to prevent all of this and to some degree reverse the scar tissue already built up. 1) Continuous passive motion (CPM)- to prevent joint stiffness and disrupt adhesions. CPM program. It involves the patient laying face down on a motorized flexion table (Leander flexion traction table 900z). The table slowly bends which gently introduces a mild bit of motion in the spinal joints. One of the most important benefits to CPM is while the motion is being applied it prevents cross linking of the collagen fibers which cause adhesions to adjacent tissues. It is important to stress the “PASSIVE” in passive motion. have shown that active motion with new injuries is not advised because muscle contraction causes compression of joint surfaces, which may be harmful to the cartilage. In addition, it increases tissue tension and therefore increases pain. are not receiving the above therapy you risk the dangers of permanent impairment. 2)Non-surgical Spinal decompression, manual soft tissue manipulation, active and passive stretching to remodel scar tissue in the joint. The sketch above shows: Poorly healed muscle on the left and properly healed muscle on the right after torn muscles and ligaments. of treatments require patients and diligence from the injured person. The remodeling of the injured tissue can take many months of continuous care to achieve optimal healing. If the patient has received inappropriate treatment the recovery period could even be longer. reading it as I have enjoyed writing it. If you have been in a car accident and you need additional help please call Dr. Wade Burbank at the Accident & Injury Clinic in Vancouver, WA (360-567-1739). treatment and referral options possible. The Accident & Injury Clinic is a privately owned and operated clinic dedicated to the treatment of auto accident and work injuries. In a time of managed care, when many offices have become nothing more than patient mills, we offer old fashion doctor patient interaction while using modern techniques to encourage timely healing. The doctors themselves provide nearly all the treatment, one on one. “One of my focus areas is on those patients injured in auto or work related accidents”. burdens of proof of injury to satisfy the legal system. to the insurance company or a court then your claim will be compromised. Dr. Burbank has made it his life’s work to properly manage these injuries along with the medical and legal issues that are so important to your health and insurance claim. His fifteen years of experience has exposed him to every aspect of auto injury. Don’t leave your health to chance by going to any doctor to be treated by just medication. The Accident & Injury Clinic provides the quality of injury care you deserve. a year after the accident, I met Dr. Burbank and became his patient. 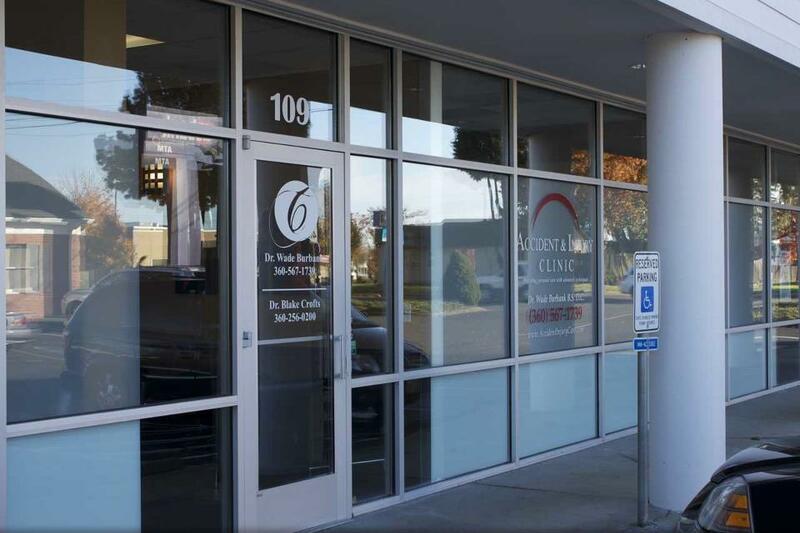 office at 360-567-1739 and pick a time convenient for you to come in for your accident & injury evaluation. If you are calling after the office closes for the day, leave a message and a number where we can reach you. One of my assistants will call you the next day. Your accident has been a big enough hassle already, from getting your car fixed, to dealing with your insurance adjuster. That’s why we’re dedicated to working around your schedule so you can go about living your life on your terms. like, we’ll even give you a list of attorneys to choose from. for them as well just to make sure everyone is really okay. to ensure their bodies are in good working order and are not subjected to unnecessary pain, suffering, or physical problems later in life. Don’t worry, if we do detect an injury, our care is both safe and effective for children of all ages. costs, so there is no reason to delay. If you’re planning on seeking legal representation, the sooner you document your injuries, the better your case will turn out. Delaying only makes things worse for both your health and for successful litigation. ineffective and may even be harmful to you! P.P.S. – I can’t stress this enough. less severe it will be, and the easier it will be to treat. life the way it was before the accident.